Let your taste buds sizzle with the flavour of our Nachani Chips. These zesty, tangy and savoury wafers are not only good in taste, but also help you lose weight and will leave you craving for more. 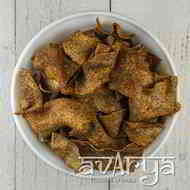 These chips are high on nutrients and are suitable for those who are health-conscious. Nachani Chips	NK-ST-1325 Let your taste buds sizzle with the flavour of our Nachani Chips. These zesty, tangy and savoury wafers are not only good in taste, but also help you lose weight and will leave you craving for more. These chips are high on nutrients and are suitable for those who are health-conscious. Nachani Flour, Spices, Starch, Iodized Salt & Edible Veg Oil. The shelf life of Nachani Chips is 60 days.